Memories are the ultimate foundation of testimony in legal settings ranging from criminal trials to divorce mediations and custody hearings. Yet the last decade has seen mounting evidence of various ways in which the accuracy of memories can be distorted on the one hand and enhanced on the other. This book offers a long-awaited comprehensive and balanced overview of what we now understand about children's and adults' eyewitness capabilities--and of the important practical and theoretical implications of this new understanding. 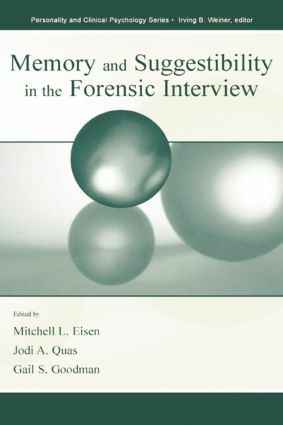 The authors, leading clinicians and behavioral scientists with diverse training experiences and points of view, provide insight into the social, cognitive, developmental, and legal factors that affect the accuracy and quality of information obtained in forensic interviews. Armed with the knowledge these chapters convey, practitioners in psychology, psychiatry, social work, criminology, law, and other relevant fields will be better informed about the strengths and limitations of witnesses' accounts; researchers will be better poised to design powerful new studies. Memory and Suggestibility in the Forensic Interview will be a crucial resource for anyone involved in elucidating, interpreting, and reporting the memories of others.